You are looking at a 1971 Pontiac Trans Am with matching numbers 455 HO and M-22 close-ratio Rock Crusher transmission. This is one of only 885 1971s with the four-speed. 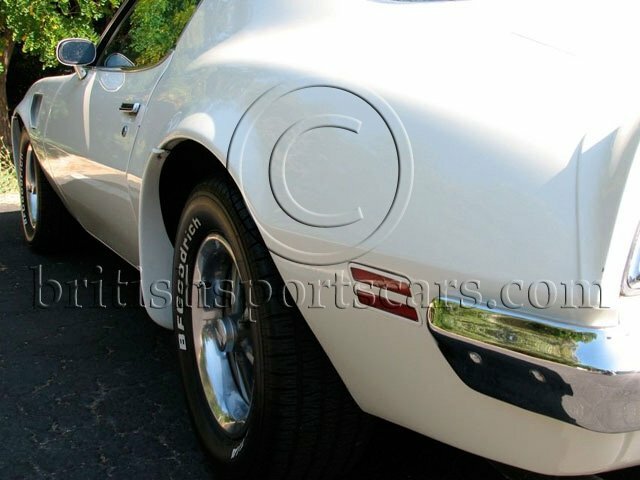 The 1971 Trans Am is rare and desirable for a number of reasons. It was the first year with the 455 HO, rated at 335 horsepower and 500 lb/ft of torque. It was also the last year before horsepower ratings began decreasing due to emissions restrictions. The 1970 Trans Am had a Ram Air 400 with considerably higher compression; ten more horsepower, and 55 lb/ft less torque. The Rock Crusher transmission was only offered in the Trans Am in 1971 and 1972. The 1972 Trans Am was rated at 300 horsepower. In the early 1970s, the Trans Am was a true performance car, and comprised a small percentage of the Firebirds produced. Their identification decals were modest relative to the later models. The early Trans Am cars drew attention to themselves by the sound of the highly-tuned engines, while the later cars drew attention with gaudy graphics. By the late 1970s, after a starring role in the Smokey and The Bandit movies, Firebird and Trans Am production rose considerably. More than half (110,000) of the 210,000 Firebirds produced in 1979 were Trans Ams. As the Bird Decal (sometimes referred to as the "Screaming Chicken") on the hood grew, the horsepower shrunk. By 1979, the most powerful engine available in the TA was rated at 220 horsepower. The 1971 Trans Am four-speed models growl from both the close-ratio Rock Crusher transmission with straight cut gears, and from the tailpipes. It's an awesome sound that has to be heard in person to be truly appreciated. We would rather overstate the negative aspects and understate the good in order to have someone very pleased when they see the car, than have someone make an effort to see the car and then wind up disappointed. I will do my best to describe the vehicle as accurately as possible. The bad first: this is not a rotisserie-restored trailer-queen. This is a car that was driven for many years like a Trans Am owned by a young man in the 1970s and 1980s would be driven. It experienced the inevitable front-end damage in 1986 when the car left the road at a high rate of speed, drove through a fence and skidded through a pasture for about two-hundred feet, thankfully, it did not roll over. I did not witness the incident, but saw the aftermath, both the field and the car. After sitting for several years, in 1996, the body and frame damage were repaired to "driver" specs, but not to Concours condition. Other than the small bird on the nose, it has no decals or Trans Am graphics. The egg-crate grill is cracked; it is not cherry under the hood; there are a few areas with bubbling under the paint; the stripe is not correct; it has none of the factory production decals; no jack or spare, and due to the previously-mentioned off-road experience, likely does not have entirely original sheet-metal. The differential appears to be from a newer model and is closer to 3.08 or 3.23 and does not work as well off the line with the close-ratio M-22 as the original 4.10 ratio would. The interior is not perfect and there is a crack in the dash. There is rust on the dash below the corner of the windshield on the driver's side. The rims are not original to the car, and the centers are not correct for this year. While the headlights, tail lights, brake lights, and turn signals all work, the dome light, wipers, AM radio (plus 8-track) and ventilation system do not work. All of the gauges work but the clock does not. It is currently garaged but has not always been garaged. Most of the rubber bits (other than tires and hoses) are likely original and need to be replaced (bushings, door seals, etc.) I would be happy to elaborate on any of the above to the best of my knowledge. Now the good: this is a very rare, highly desirable, matching-numbers car, and one of very few remaining. Early Trans Ams were extremely high-performance cars. Performance cars of this era were driven hard on a regular basis. Many were totaled within a short period of time. This car has been in my possession since 1988. I have the PHS documentation for this car, which has spent its entire 39 years in California. The car is a driver, runs very strong, looks perfect from 20 feet, great from seven feet, and only gives away its age up close. The engine was rebuilt a few years ago and has approximately 1,000 miles on the odometer since the rebuild. The car starts right up, shows good oil pressure on the dash gauge, runs cool, and has 180 compression all the way around. Brakes have recently been gone through front and back. The car just had an oil change and tune-up, and new shocks have been installed. The BFG Radial TA tires are brand new, and the 235/60 15 size is as close as possible to the original F-60 15-bias-ply that were on the car when it was brand new. The car does not appear to abuse oil, drives well for its age, tracks straight, does not pull to either side, and stops exactly like it should. While it has been wrecked and repaired, it was never butchered. The interior panels were not cut for speakers, the body did not have fiberglass flares added, etc. I have communicated with the second owner who purchased the car in the mid 1970s and later sold the car to the person from whom I acquired the car more than a decade later. The car did not come from the factory with A/C, however, there is an A/C compressor under the hood (not working) and the vent system controls have an A/C option. The car was originally shipped to Fresno so it could have been dealer -installed at the time. The engine was rebuilt close to factory specs, but not exactly. The original QJet carburetor is long gone, replaced with an Edelbrock unit. It is still a low compression engine (8.5 to 1, /-) and it runs well on premium pump fuel. 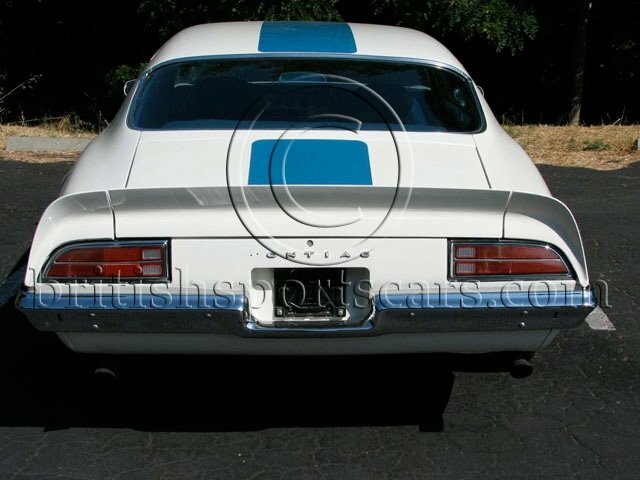 I have a blue 1971 CA plate on the car with 1972 and 1973 registration stickers which will be included in the sale, but the car was most recently registered in CA with a newer plate. The paint and chrome are not perfect but look good for their age. Some, but not all of the interior was replaced in 1996. Due to the original engine/transmission, this car could be a great place to start a 100 point restoration. In the meantime, it is a nice car as it sits, and can be driven until you are ready to restore. It will not embarrass any but the most fastidious purists. The current owner is selling because he is relocating to the Pacific Northwest. This lifetime California car would have a tough time surviving the very wet winters there, whether in storage or driven, and deserves a fate better than being reduced to rust. This classic deserves to thrive in the Golden State! Please do not hesitate to contact us with any questions you may have about his unique piece of American muscle.